People with diabetes have special nutritional needs, which often are not completely satisfied with ordinary multivitamins or diets. MultiBetix is a complete food supplement that acts on the immune, cardiovascular, nervous and visual systems. 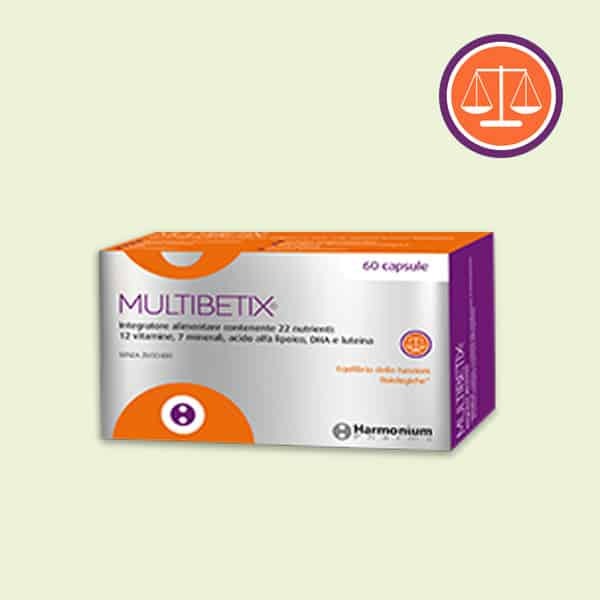 Unlike ordinary multivitamins, the MultiBetix formula does not contain iron, copper and vitamin K which, when over consumed, could increase the risk of developing complications. Instead, MultiBetix contains distinctive features such as DHA, alpha-lipoic acid and lutein which prevent the degeneration of blood vessels, nerve fibers and eye. We recommend taking two capsules a day. Nutritional supplementation for type 2 diabetes: a systematic review. – Bartlett HE1, Eperjesi F. Ophthalmic Physiol Opt. 2008 Nov;28(6):503-23. At low doses, a gamma-linolenic acid-lipoic acid conjugate is more effective than docosahexaenoic acid-enriched phospholipids in preventing neuropathy in diabetic rats. – Pitel S1, Raccah D, Gerbi A, Pieroni G, Vague P, Coste TC., J Nutr. 2007 Feb;137(2):368-72. Beneficial effect of docosahexanoic acid and lutein on retinal structural, metabolic, and functional abnormalities in diabetic rats. – Arnal E1, Miranda M, Johnsen-Soriano S, Alvarez-Nölting R, Díaz-Llopis M, Araiz J, Cervera E, Bosch-Morell F, Romero FJ., Curr Eye Res. 2009 Nov;34(11):928-38. Epidemiological associations between iron and cardiovascular disease and diabetes. – Basuli D, Stevens RG, Torti FM, Torti SV. Front Pharmacol. 2014 May 20;5:117. Iron increases diabetes-induced kidney injury and oxidative stress in rats. – Gao W1, Li X, Gao Z, Li H. Biol Trace Elem Res. 2014 Sep;160(3):368-75. The role of zinc, copper and iron in the pathogenesis of diabetes and diabetic complications: therapeutic effects by chelators. – Zheng Y1, Li XK, Wang Y, Cai L., Hemoglobin. 2008;32(1-2):135-45. Copper: effects of deficiency and overload. – Scheiber I1, Dringen R, Mercer JF. Met Ions Life Sci. 2013;13:359-87.